The operation team had experienced issues with difficult-to-reach bearings inside a large fan housing and wanted to stay ahead of the game in future. Plant Engineer Michael Plawecki explains, “the malting process was established literally thousands of years ago and still involves steeping, germination and kilning of barley ears. The big difference is now the scale of operation; we process many tonnes at a time and the last two processes rely on a steady supply of blown air. The fans and motors that provide the air are critical to our operations. “Like many food industries, the principles of the process are quite traditional, but we rely on automation, electro-mechanical equipment and sensors to provide fine control over air flow, heat and moisture. Each batch is very valuable, not just in monetary terms but also to the customer, so we are extremely pro-active when it comes to maintaining our equipment". The Mitsubishi Electric SCM solution comprises of smart sensors attached to bearing housings, gearboxes, pumps and motors, which sense when equipment starts to operate outside its normal envelope due to wear. It provides a sophisticated early warning system for critical pieces of rotating plant equipment. Vibration frequencies and temperature readouts are monitored continuously and fed back to a Mitsubishi L-Series PLC via industrial Ethernet. The controller is housed in a robust enclosure and easily connected to other network system hardware and software platforms, such as the SCADA system at Muntons Malt. 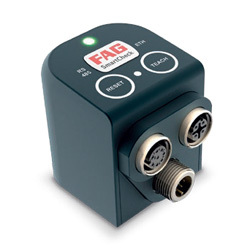 The sensors are developed by bearing expert FAG and can be set-up to recognise tell-tale signs in complex vibration patterns specific to the type of equipment it is attached to. The intelligent part of the software compares the data it is receiving with highly developed data models from thousands of previous installations, providing virtually fool proof analysis and alerts. For more information on the Mitsubishi Electric SmartCheck, download a copy of the brochure on the right. Alternatively, give our Technical Support Engineers a call and they will be happy to discuss your specific requirements.